Sensitive Teeth Information - Get in Touch..
At some point in life, most people will experience sensitive teeth which can range from a mild twinge to severe discomfort. Sensitivity can last for a very short period of time or over a more prolonged period of time. Sensitivity seems to be more common in people aged between 20 and 40, although it can affect people in their early teens and when they are over 70. Women also, are more likely to be affected than men. Brushing too hard (this is known as ‘toothbrush abrasion'), and brushing from side to side, can cause the tooth enamel to be worn away - especially where the teeth meet the gums. The freshly exposed dentine may then become sensitive and cause discomfort. Dental erosion: this is when there is a loss of tooth enamel caused by attacks of acid from acidic food and drinks. If enamel is worn away, the dentine underneath is exposed and this can lead to sensitivity. Over time, gums may naturally recede (shrink back), and the roots of the teeth can become exposed and can therefore become more sensitive. 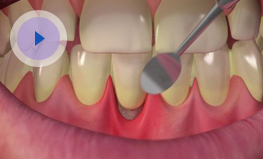 Root surfaces do not have an enamel layer to protect them. A cracked tooth or filling: a cracked tooth is one that has become broken and can sometimes be difficult to detect. A crack can run from the biting surface of a tooth down towards the root. Extreme temperatures, especially cold, can cause discomfort. In order for us at Dental fx to understand what is causing your sensitivity we will carry out a thorough examination and chat to you about your symptoms. There are various methods which can be used to treat the affected teeth such as applying special ‘de-sensitising' products to help relieve the symptoms. Fluoride gels, rinses or varnishes can be applied to sensitive teeth. These can be painted onto the teeth at regular appointments one or two weeks apart, and this helps to build up some protection. Sensitivity can take some time to settle, and you may need to have several appointments. If you are experiencing sensitivity either short term or long term, please do give us a call on 0141 931 5533 and we will book you in for the earliest convenient appointment.